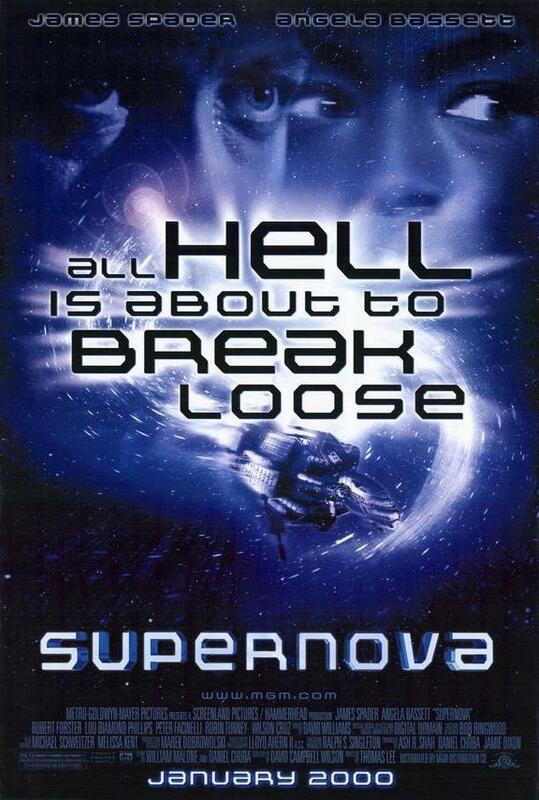 SUPERNOVA: In Space, Everyone Can See You Second-Guessing – Schlockmania! When the story of a film with a troubled production hits the news, it sets a perception of the film in stone as having little worth. Even if a film manages to rise above its press-sealed bad reputation and develop a cult following after the fact, like Ishtar or Heaven’s Gate, the sad truth is that the initial perception of the film will remain the reality for most onlookers. That said, this state of affairs exists because most films with troubled productions often turn out unsatisfying. Supernova offers a case where the negative tales of production are reflected in a muddled quality to the finished product. 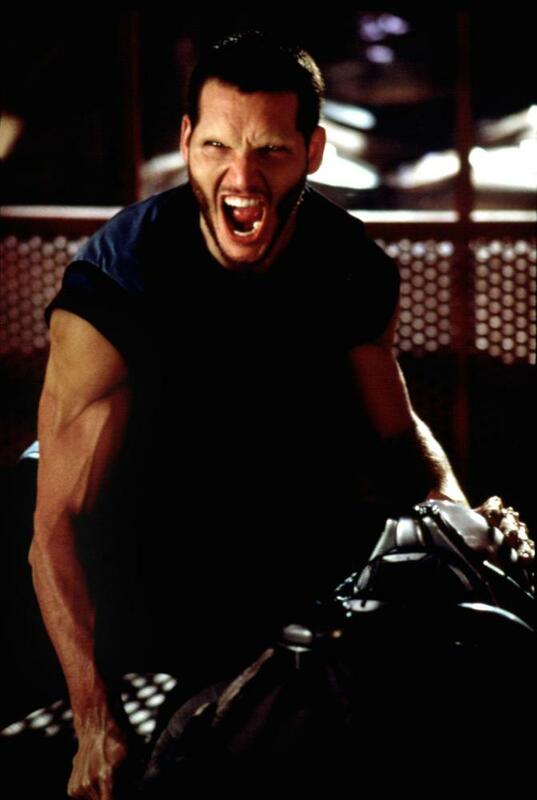 Supernova had one of the more troubled birth cycles of any Hollywood film in recent memory: it began as a small-scale effects showcase, only to change in tone when director Walter Hill took the helm and rewrote the film to his style. Unfortunately, Hill had to deal with a lot of studio interference and this led to him leaving the film as it moved into post-production. At that point, MGM brought in everyone from Jack Sholder to Francis Ford Coppola to save the film. The r esult of all this tampering and second-guessing feels like a strange battle of impulses between a tough genre exercise and something designed to cater to audience expectations. The protagonist is Nick (James Spader), a recovering drug addict whose return to space missions becomes a trial by fire when the medical aid ship he’s on has to warp through space and time to answer a distant distress call. 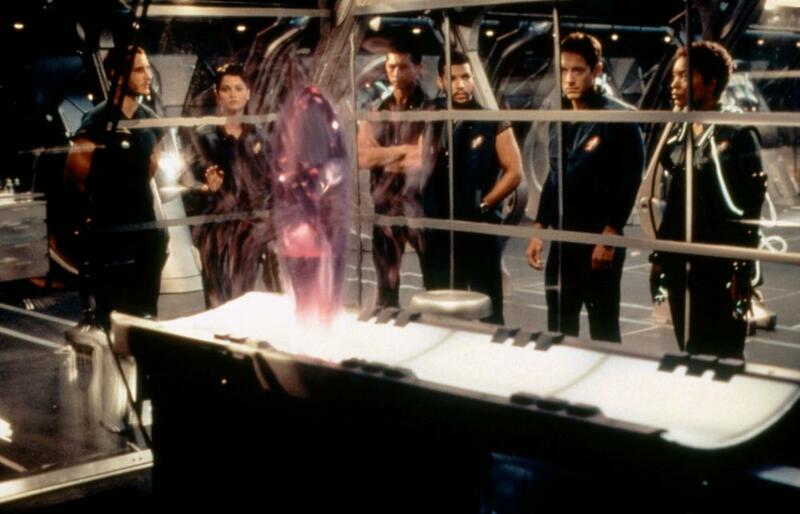 A mishap from the warp results in Nick becoming captain as the crew discovers a lone survivor (Peter Facinelli) who brings a strange object aboard the ship. Neither the survivor nor the object are what they seem and Nick has to work with his crew to fight off an interstellar threat that wants to destroy more than just them. As you watch Supernova, it’s easy to feel the heavy hand of the studio executives. It often feels like a well-budgeted episode of a t.v. sci-fi show with grander effects and a little R-rated sleaze. The story’s big reveal leads to a finale that plays like a lesser Star Trek episode or a t.v.-movie size ripoff of Alien, falling into stock action beats and underwhelming, small-scale special effects rather than the kind of slam-bang finale it seems to be building to. Supernova also has a nice cast but gives most of them too little to do and not enough space to build a characterization: Robert Forster gets high billing for what amounts to a glorified cameo and Robin Tunney gets to do little besides take off her top a few times and look scare d. Lou Diamond Phillips is similarly wasted as a Tunney’s significant other and is often shunted out of the film’s action completely. That said, Supernova remains watchable for such a high-profile example of excessive studio tinkering. It has a consistently quick pace, handsome production design and shapes up as a passable time killer for those in the proper, undemanding frame of mind. Facinelli is a bit miscast as the story’s mystery figure – he often comes off as an arrogant pretty boy rather than the threatening figure he is supposed to be – but Spader gives a solid, low-key performance as the film’s taciturn yet courageous hero. Spader also gets good support from Angela Bassett, who acquits herself nicely as the ship’s doctor and a kind of back-up heroine. In short, the story behind Supernova is ultimately more interesting than the film itself. That said, it’s not the unwatchable disaster that it is made out to be in some quarters and curiosity seekers will find it to be a technically competent if underachieving diversion.